Daniel Pearl Magnet High School (DPMHS) is proud to announce PearlCon IV, the fourth annual Board Game and ComicBook Convention to be held on Saturday, May 11, 2019 from 9:00 am - 3:00 pm. Admission is $5. 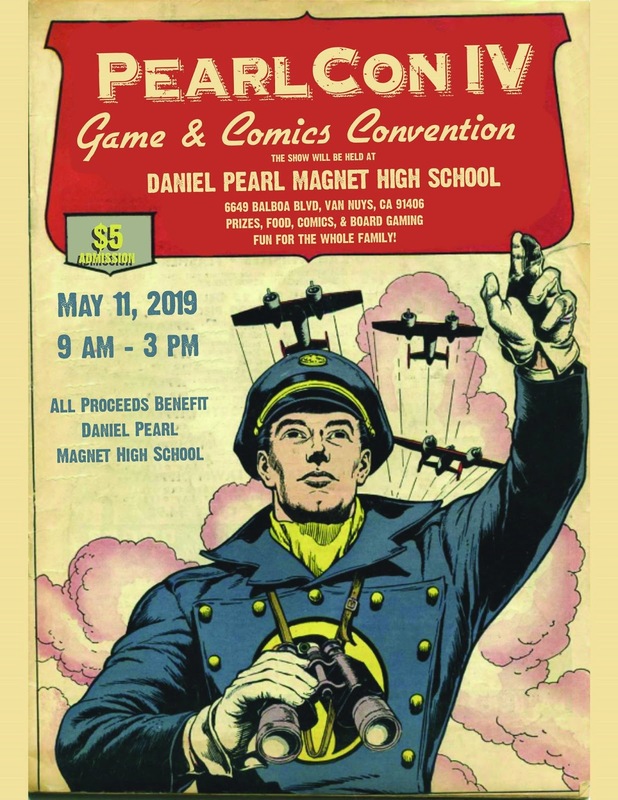 The event is sponsored by the Daniel Pearl Magnet High School PTSA and Associated Student Body, and will be held on the DPMHS campus.The event is targeted for Middle School and High School students, and is intended to be a day of fun and enjoyment for both kids and parents. There will also be an added WWII segment for which The Museum SFV's own Franky Ortega will have special guests and booths educating attendees on the history of the Birmingham General Hospital and the school and areas involvement and history on WWII. Come, meet and learn from WWII veterans too! The Museum SFV will h ave a booth at the event. Local game stores and comic book stores will be on campus in the Dealers Room, and will running games, talks, and seminars throughout the day. The school is using this event as a fundraiser for our school, since the majority of families do not have the means to help finance activities at the school. Our hope is to raise funds to support our basic operation as well as fund specific projects such as sending students to national journalism conventions, purchasing equipment for use by our newspaper and filmmaking students, and providing more resources in our library. One of the traditional activities during PearlCon is a silent auction of materials that have been donated by local merchants. We are seeking distinctive items and baskets, such as toys, small appliances, tickets, gift certificates, or any services. Local businesses may make a monetary, product or service donation. If you choose to participate, your store will be recognized in a special supplement of The Pearl Post, our school’s nationally recognized award-winning newspaper. If you wish to provide us with a banner, will be happy to display your banner during the Convention in a prominent location. DPMHS is a the smallest comprehensive public high school in the Los Angeles Unified School District, with an enrollment on only 360 students. Despite its small size, DPMHS is routinely recognized as one of the best schools in the nation by publications such as U. S. News and World Report, who include our school in the top 5% of all high schools. The school routinely achieves 100% graduation rates each June, and sends its students to colleges and universities throughout the nation.